Trying to decide what to serve alongside your delicious mains this Easter? Nothing complements an Easter lunch or dinner quite like a fresh salad. I’ve put together 5 of my most effortlessly impressive salads that are made from everyday ingredients and complement anything. These salads are nutritious, packed full of flavour and most importantly – delicious! Instead of just serving roast veggies, why not put them in a salad? 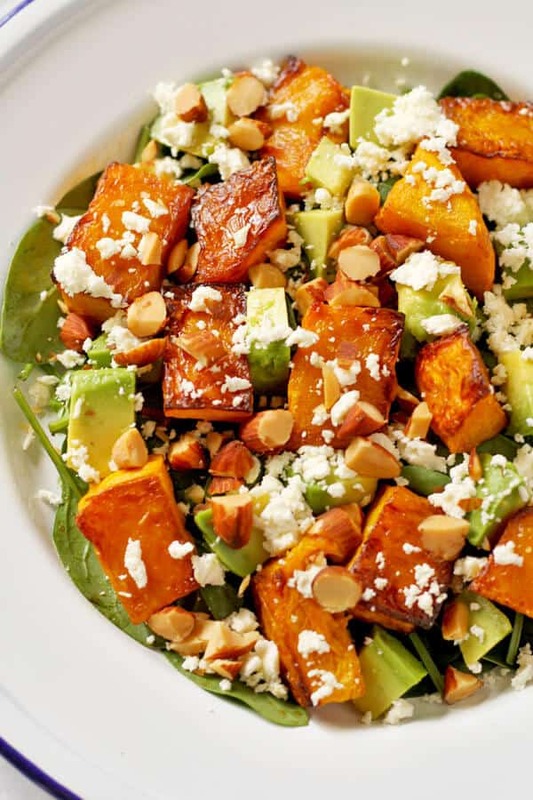 This Roast Pumpkin, Spinach and Feta Salad has a Honey Balsamic Dressing that is to die for, and is made with just 10 easy ingredients. It also stores well in the fridge, so feel free to make ahead the night before. 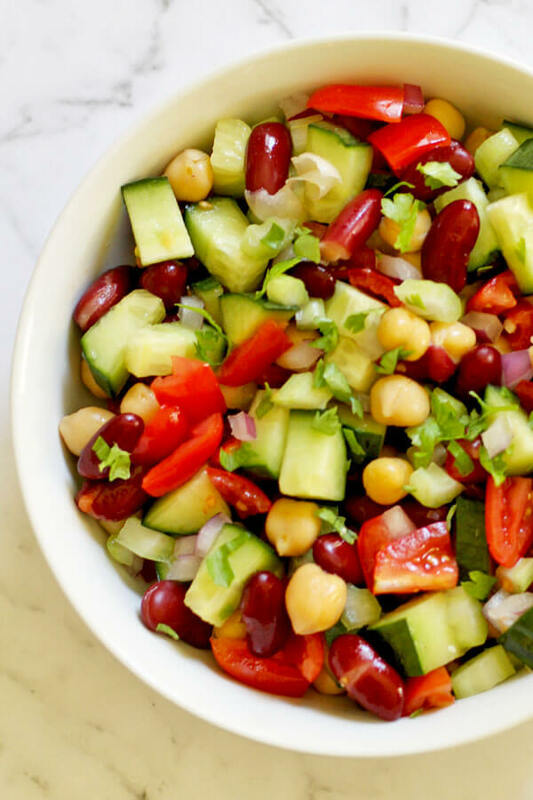 This Middle Eastern Bean Salad comes together in less than 10 minutes, with a bunch of fresh and flavourful ingredients and is topped with parsley and a light lemon vinaigrette. It’s also a great make ahead salad, and will keep well in the fridge until you’re ready to eat. 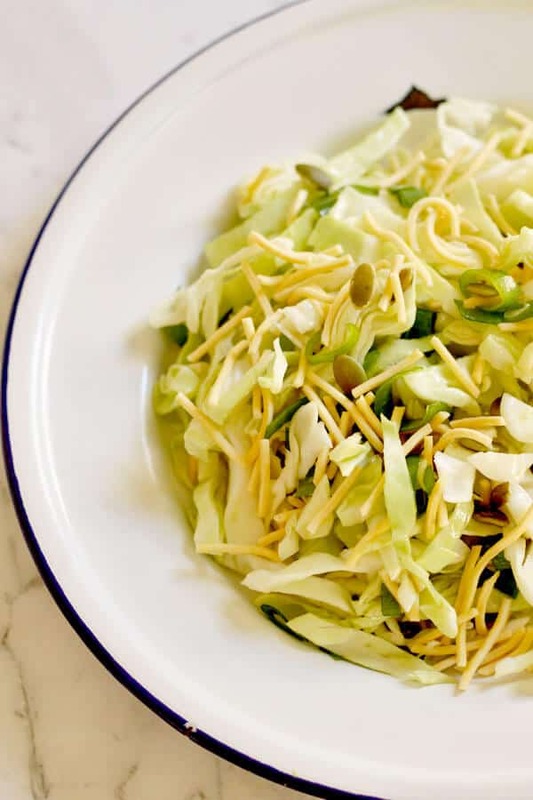 This Cabbage and Crunchy Noodle Salad is a classic when it comes to Aussie cuisine. The Oriental-Style dressing is the perfect mix of sweet and savoury, and the crunchy noodles make it irresistible to kids and adults alike. Leave the dressing and noodles until last minute to keep everything crisp. 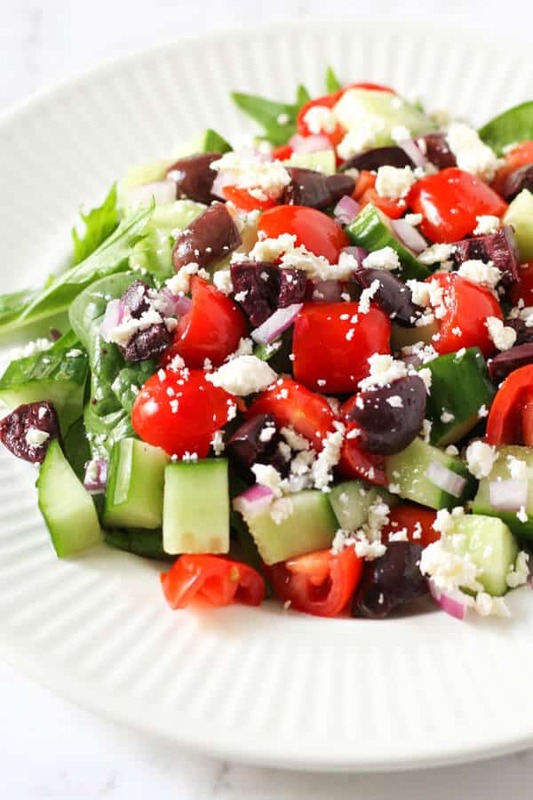 It’s hard to go past the classic Greek Salad when you’re looking for sides that complement most mains. It’s also one of the simplest to put together – it can be on the table in just 5 minutes. When you’re ready to serve, simply drizzle over some EVOO and fresh lemon juice for an easy dressing. 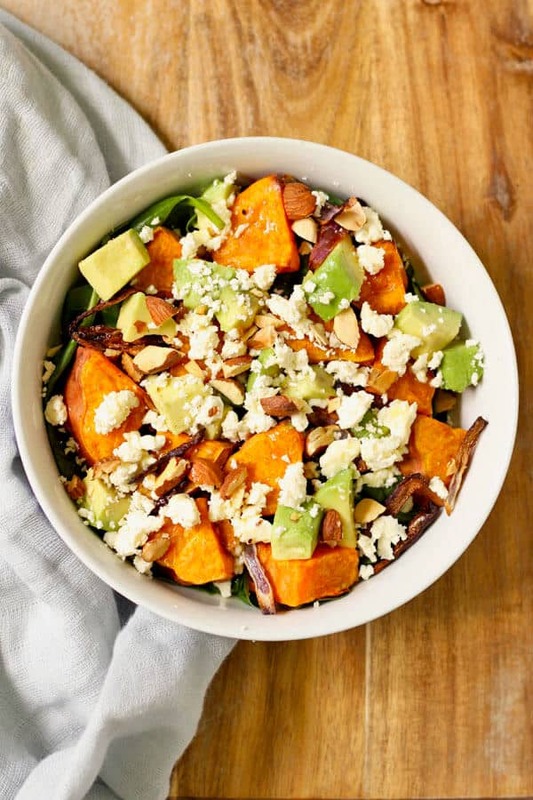 This Roasted Sweet Potato, Avocado and Feta Salad is another perfect way to serve up roast veggies in the form of a salad. The crispy roasted onions are definitely a highlight, as well and the crunchy chopped almonds. There won’t be any left after you put this out on the table. 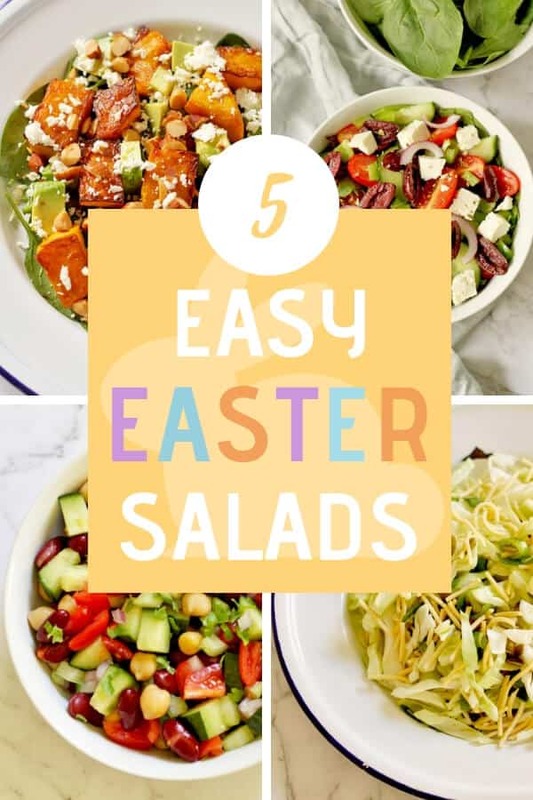 Whether you’ve only been assigned salad duty or you’re putting together the entire meal, I hope you’ve found the perfect side salad (or two) to pop on the table this Easter. I hope your family has a great holiday surrounded by loved ones and great food. Just be sure to leave some room for Easter Eggs! Looking for some meatless meals for Good Friday? Check out my Vegan collection.